1890: Happy 127th Birthday, Jelly Roll Morton! Ferdinand Joseph LaMothe was born on October 20, 1890 in New Orleans. Morton recorded “Mr. Jelly Lord” with the New Orleans Rhythm Kings on July 17, 1923 in Richmond. 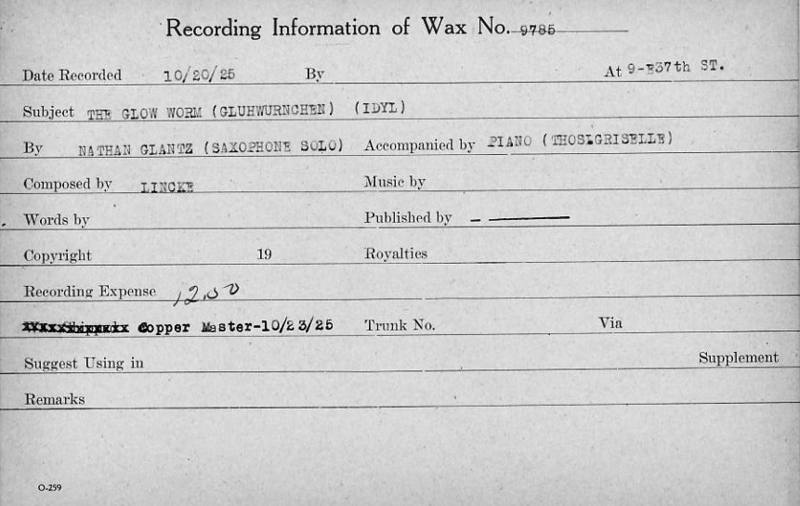 1925: Nathan Glantz recorded “Glow Worm (Gluhwurnchen)” in NYC. It appeared on Gennett 3170 and featured Glantz (as) and Thomas Griselle (p). 1949: Cryin’ Sam Collins passed away. Video | This entry was posted in Champion, Gennett, Gennett Walk of Fame, Video and tagged Cryin' Sam Collins, Gennett, Gennett Discography, Gennett Records, October, Sam Collins. Bookmark the permalink.